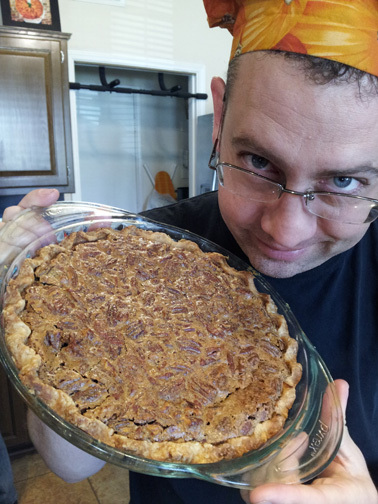 Pumpkin Bourbon Pecan Pie | Have YOU Ben Starr Struck? I love to bake, especially pies, even though I don’t eat dessert most of the time. However, my two favorite pies in the world are pecan pie and, naturally, pumpkin pie. My friends finally convinced me to meld the two pies together into one…and thus was born my pumpkin pecan pie. But what about the bourbon, you ask? In my effort to try to reduce processed ingredients in my recipes, I had a come-to-Jesus moment about corn syrup. While I’m not as terrified of corn syrup as I am of high-fructose corn syrup (when was the last time you saw high-fructose corn syrup on grocery store shelves?!? ), there’s still something that doesn’t feel right to me about reading the words “CORN SYRUP” in a recipe…especially when it’s one of the primary ingredients. And…come on…was my great-great-great grandmother pulling out a bottle of Karo corn syrup when she made pecan pie in the mid 1800s? I don’t think so. Yet somehow EVERY RECIPE ON EARTH for pecan pie seems to call for either light corn syrup or dark corn syrup. That doesn’t smell right to me. So I decided to forge ahead into uncharted waters and make my own sweet syrup from more familiar, less processed ingredients like brown sugar, maple syrup, and bourbon. “But isn’t bourbon a processed ingredient?” you ask. Actually, brown sugar is a processed ingredient, too. As is maple syrup. But I can make bourbon in my kitchen. I can’t make corn syrup. To do that I have to extract corn starch from corn (God only knows how to do that), then either pressure cook it with hydrochloric acid, or ferment it with amylase and several other enzymes. I’d rather use bourbon, thank you very much! Bring to a boil, reduce heat to medium, and stir constantly for about 5 minutes. It will boil over unless you keep stirring and/or blowing on the surface. The bubbles will change from looking fizzy and small to looking glassy, sticky, and large. It will have reduced to around 3/4 cup. Pour back into the liquid measuring cup. If you have much more than 3/4 cup, reduce further. Let it cool. Whisk all together until smooth, set aside. Whisk together the ingredients. Then assemble the pie by pouring the pumpkin filling first, smoothing, and then carefully adding the pecan layer on top. Bake on the middle rack of a preheated 325F oven for 1 hour and 45 minutes. Test by inserting a knife into the center of the pie. It should come out clean without streaks. Let cool fully, at least 2 hours, before slicing. Here is a video tutorial showing how to bake this pie! This entry was posted in Desserts, Recipes, Vegetarian and tagged bourbon, pecans, pie, pumpkin. Bookmark the permalink. Please change your online recipes….in your youtube video you correct yourself and change the pumpkin pie recipe from 1 tablespoon of vanilla to 1-2 teaspoons of vanilla, and change 1 tablespoon of cinnamon, ginger, and cardamom to 1-2 teaspoons of cinnamon, 1 teaspoon of ginger, and 2 teaspoons of cardamom. We made your recipe exactly to the web page specifications….and had to throw out the pie. Way too many spices. Ruined 4 hours of my time. OMG!! I made this for Halloween and was immediately voted to bring the same dessert for Thanksgiving. This is by far THE BEST pie I’ve ever made or enjoyed. I had quit making pies long ago because of the crust being such a pain to make, and the butter crusts always seem way too greasy for me. Ben’s Mom is a genius and has my undying gratitude for her divinely inspired creation of this easy and delicious crust. I used sunflower oil and the crust was the lightest and most flaky I’ve ever made. THANK YOU THANK YOU THANK YOU to Mrs. Starr for creating, and to Ben for sharing!! I LOVE YOU GUYS! p.s. just made a quiche with this crust and used buttermilk for the milk – it is fantastic. Now I’m looking for more pie recipes…anyone got a good one they want to share? Oh, Ginger, my Mom will be so pleased when I share your comment with her. I know…it’s embarrassing how easy and quick the oil crust is, and it tastes fabulous. I think Mom got this, or something like it, from an old Betty Crocker cookbook, she’s been making it for years. I’ll have to try sunflower oil!!! ben, keep up the good work. your pumpkin pie recipe has made me a local fall hero. honestly, when i take it to a party, the praise gets to be too much. haven’t tried this one yet. my father in law hates pumpkin pie, but loves pecan. maybe this can open his eyes to the splendor of the king of fruits.